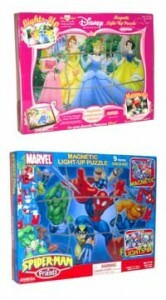 Jazwares, Inc. is recalling about 30,000 “Link-N-Lite” magnetic, light-up puzzles sold under the Disney and Marvel brand names. Small magnets used to connect the puzzle pieces can fall out. Magnets found by young children can be swallowed or aspirated. If more than one magnet is swallowed, the magnets can attract each other and cause intestinal perforation or blockage, which can be fatal. The firm has received reports of nine incidents where magnets became loose from these puzzles. No injuries have been reported. The recalled Link-N-Lite Magnetic Light-Up Puzzle, which is a double-sided plastic magnetic puzzle for ages 3 and up, has two designs. The Disney-brand puzzle shows the Disney Princesses on the front and Ariel, from The Little Mermaid, on the back. The Marvel-brand puzzle shows “Spider-Man & Friends” on both sides. Each puzzle measures 8 inches by 10.5 inches, contains nine pieces with four or six magnets per piece, and lights-up when all pieces are in place. A 9-volt battery is placed in the center bottom piece that contains a battery case. Consumers should immediately stop using the puzzles and contact Jazwares for a free replacement toy that does not contain magnets. For additional information, contact Jazwares Inc. at (800) 370-1827 between 9 a.m. and 5 p.m. ET Monday through Friday, or visit Jazwares’ Web site at www.jazwares.com.